Chris* maintains a diverse commercial and regulatory practice acting for governments, international organizations, banks, multi-national corporations and regulated professionals. Whether in court, a tribunal or a high-stakes boardroom meeting, Chris plays§ to win at all times. Before joining Lenczner Slaght, Chris worked for a Public Inquiry and spent time in the trade and investment group at the Canadian Embassy in Washington D.C., where he honed his strategic decision-making skills. As a life-long hockey player, he knows how to stick handle high-stakes cases where every party is playing for keeps‡ . A skilled advocate, he shares his advocacy tips and tricks as a moot coach of his alma mater's Jessup Moot team and as a member of the Gale Cup Moot committee. Chris has also written articles on topics ranging from international arbitration to securities law. .
His practice encompasses a broad range of civil litigation, including corporate-commercial, investment and regulatory matters. He has a particular focus on commercial disputes, corporate restructuring and insolvency proceedings and class actions. As part of his professional liability practice, he also routinely defends physicians on behalf of the Canadian Medical Protective Association. 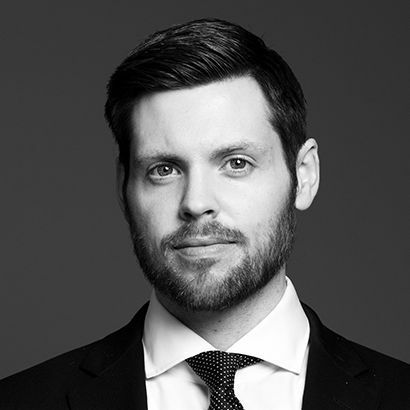 Chris has been counsel at all levels of Court in Ontario, the Supreme Court of Canada and any number of statutory and arbitral tribunals involving domestic and international arbitrations. He has published a number of articles on topics ranging from domestic and international arbitration to securities law. Prior to joining Lenczner Slaght, Chris worked for the Missing Women Commission of Inquiry undertaken by the Province of British Columbia and in the trade law and investment group at the Canadian Embassy in Washington D.C. While at law school, Chris and his teammates placed first in both the Lerners LLP and Gale Cup moots and were selected to represent Canada at the Commonwealth Moot in Cape Town, South Africa. Since being called to the Bar, Chris has remained involved in mooting and now serves as the President of the Gale Cup Moot Committee. He also serves as a member of the Young Advocates Standing Committee, a committee representing young advocates within The Advocates’ Society. Counsel in an arbitration concerning a Project Management Agreement governing the development of a 150 unit condominium complex in midtown Toronto. Counsel to Société Générale in a putative class action pending in the Ontario Superior Court of Justice relating to allegations of conspiracy and price fixing in the global foreign exchange market. Counsel to the International Olympic Committee in an application before the Human Rights Tribunal of Ontario. Successful in having proceeding dismissed for lack of jurisdiction. Counsel to Société Générale in a proposed class action alleging conspiracy and price fixing in connection with the international gold market. Counsel to an international organization in an appeal at the Supreme Court of Canada relating to the immunities of international organizations in criminal proceedings. Given the expansive discovery rights available under US law, plaintiffs may be tempted to try to use those rights in pursuit of proceedings under Canadian law. In its recent decision in Mancinelli v RBC, the Divisional Court placed an important limit on the ability of parties to do so. The Divisional Court upheld an order requiring plaintiffs in a proposed class action to obtain Court approval before taking any steps in furtherance of a subpoena issued by an American court. Ontario’s new legislation governing international commercial arbitration, the International Commercial Arbitration Act, 2017, came into force on March 22, 2017, replacing the International Commercial Arbitration Act previously in place. The Court of Appeal addressed the admissibility and permissible use of surreptitiously recorded video surveillance evidence at trial in its recent decision Iannarella v. Corbett, 2015 ONCA 110.